MARTÍ, J. Assessing Volcanic Hazard: A Review. Oxford Handbooks Online. Retrieved 14 Oct. 2017, from http://www.oxfordhandbooks.com/view/10.1093/oxfordhb/9780190676889.001.0001/oxfordhb-9780190676889-e-32. Sainz-Maza, S., Montesinos, F. G., Martí, j., Arnoso, j, Calvo, m, Borreguero, A. Structural interpretation of El Hierro (Canary Islands) rifts system from gravity inversion modelling. Tectonophysics (2017) DOI: 10.1016/j.tecto.2017.05.010. SOBRADELO, R., MARTI, J. Statistics, probabilities, uncertainty and their interpretation for decision-making during volcanic crises. In Bird, D., Jolly, G., Haynes, K., McGuire, B., Fearnley, C. “Observing the volcano world. Volcanic Crisis Communication”. Advs in Volcanology, Springer, (2017) DOI: 10.1007/11157_2017_15 . eBook ISBN 978-3-319-44097-2. Series ISSN 2364-3277. BARTOLINI, S., MARTI, J., SOBRADELO, R., BECERRIL, L. Probabilistic e-tools for hazard assessment and risk management. In In Bird, D., Jolly, G., Haynes, K., McGuire, B., Fearnley, C. : “Observing the volcano world. Volcanic Crisis Communication”. Advs in Volcanology, Springer, (2017) DOI: 10.1007/11157_2017_14. ISBN 978-3-319-44097-2. Series ISSN 2364-3277. D’ELIA, L., MARTÍ, J. MURAVCHIK, M., BILMES, A., FRANZESE, J. R. Impact of volcanism on the sedimentary record of the Neuquen rift basin, Argentina: towards a cause and effect model. Basin Research (2016) 1–25, doi: 10.1111/bre.12222. MARTÍ, J., BARTOLINI, S., BECERRIL, L Enhancing safety in a volcano’s shadow, Eos, 97, doi:10.1029/2016EO054161. Published on 21 June 2016. SOBRADELO, R., MARTÍ, J. Short Term Volcanic hazard assessment using Bayesian inference : retrospective application to the Pinatubo 1991 volcanic crisis. Journal of Volcanology and Geothermal Research (2015) doi: 10.1016/j.jvolgeores.2014.11.011. TELESCA, L., LOVALLO, M., MARTÌ, J., LÓPEZ, C., ABELLA. Multifractal investigation of the continuous seismic signal recorded at El Hierro volcano (Canary Islands) during the 2011-2012 pre- and eruptive phases. Tectonophysics (2015) http://dx.doi.org/10.1016/j.tecto.2014.12.019. GEYER, A., GARCÍA-SELLÉS, D., PEDRAZZI, D., BARDE-CABUSSON, S., MARTÍ, J., MUÑOZ, J. A. Studying monogenetic volcanoes with Terrestrial Laser Scanner: Case study at Croscat volcano (Catalan Volcanic Zone, Spain). Bulletin of Volcanology (2015) 77:22 DOI 10.1007/s00445-015-0909-z. BECERRIL, L., GALINDO, I., MARTI, J., GUDMUNDSSON, A. Three-armed rifts or masked radial pattern of eruptive fissures? the intriguing case of El Hierro volcano (Canary Islands). Tectonophysics http://dx.doi.org/10.1016/j.tecto.2015.02.006. 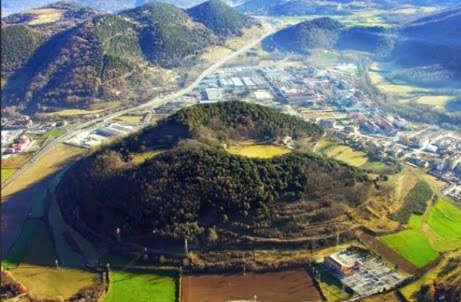 BOLÓS, X., PLANAGOMÀ, LL., MARTÍ, J. Volcano-Stratigraphy of La Garrotxa Monogenetic Volcanic Field, Northeastern Spain. In R. Rocha et al. (eds. ), STRATI 2013, Springer Geology, DOI: 10.1007/978-3-319-04364-7_232, # Springer International Publishing Switzerland 2014. GROPPELLI, G., BLANCO, M. J., GIORDANO, D., MARTÍ, J, PRINCIPE, C. Multidisciplinary Approach to the Study of Holocene Flank Eruptions in Tenerife (Canarias). In R. Rocha et al. (eds. ), STRATI 2013, Springer Geology, DOI: 10.1007/978-3-319-04364-7_236, # Springer International Publishing Switzerland 2014. PEREIRA, F., CASTRO, A., FERNANDEZ, C., CHICHORRO, M., MARTI, J. Regional Implications of New U–Pb Zircon Ages from Rhyolitic Ignimbritic Deposits and Andesitic Flows of Permian–Carboniferous Basins the Southern Pyrenees. In R. Rocha et al. (eds. ), STRATI 2013, Springer Geology, DOI: 10.1007/978-3-319-04364-7_239, # Springer International Publishing Switzerland 2014. SEGGIARO, R., GUZMAN, S., MARTÍ, J., MONTERO, C., LÓPEZ, E. Stratigraphy of the Coranzulí Caldera. In R. Rocha et al. (eds. ), STRATI 2013, Springer Geology, DOI: 10.1007/978-3-319-04364-7_243, # Springer International Publishing Switzerland 2014. MARTI, J. Chapter 24 – Scientific communication of uncertainty during volcanic emergencies, In Global Volcanic Hazards and Risk Edited by Susan Loughlin, Steve Sparks, Sarah Brown, Susanna Jenkins, Charlotte Vye-Brown Cambridge Books Online (http://ebooks.cambridge.org/). Book DOI: http://dx.doi.org/10.1017/CBO9781316276273. Online ISBN: 9781316276273. Hardback ISBN: 9781107111752, pp. 371-378. Chapter DOI: http://dx.doi.org/10.1017/CBO9781316276273.026, Cambridge University Press. PEDRAZZI, D., BOLÓS, X., MARTÍ, J. Eruptive and depositional history of La Crosa de Sant Dalmai maar (Catalan Volcanic Zone, NE Spain). Geosphere (2014), 10 (1); doi:10.1130/GES00959.1. PEDRAZZI, D., AGUIRRE DÍAZ, G., BARTOLINI, S, MARTÍ, J., GEYER, A. The 1970 eruption on Deception Island (Antarctica): eruptive dynamics and implications for volcanic hazards. Journal of the Geological Society. http://dx.doi.org/10.1144/jgs2014-015. BOLÓS, X., PLANAGOMÀ, LL., MARTÍ, J Volcanic stratigraphy and evolution of the Quaternary monogenetic volcanism in the Catalan Volcanic Zone (NE Spain). Journal of Quaternary Science (2014) 29(6) 547–560. SOBRADELO, R., MARTÍ, J. Short Term Volcanic hazard assessment using Bayesian inference : retrospective application to the Pinatubo 1991 volcanic crisis. Journal of Geophysical Research (2015) doi: 10.1016/j.jvolgeores.2014.11.011. BARTOLINI, S., BECERRIL, L., MARTÍ, J. VERDI: a new Volcanic managEment Risk Database desIgn. Journal of Volcanology and Geothermal Research (2014) 288: 132–143. BARTOLINI, S., BOLÓS, X., MARTÍ, J., RIERA, E., PLANAGUMÀ, LL. Hazard assessment at the Quaternary La Garrotxa Volcanic Field (NE Iberia). Natural Hazards, doi:10.1007/s11069-015-1774-y. GEYER, A., GARCÍA-SELLÉS, D., PEDRAZZI, D., BARDE-CABUSSON, S., MARTÍ, J., MUÑOZ, J. A. Studying monogenetic volcanoes with Terrestrial Laser Scanner: Case study at Croscat volcano (Catalan Volcanic Zone, Spain). Bulletin of Volcanology DOI 10.1007/s00445-015-0909-z. D’ELIA, L., MARTÍ, J. Caldera events in a rift depocentre: an example from the Jurassic Neuquén basin, Argentina. Journal of the Geological Society of London (2013) doi: 10.1144/jgs2012-116. PEDRAZZI, D., MARTÍ, J., GEYER, A. Stratigraphy, sedimentology and eruptive mechanisms in the tuff cone of El Golfo (Lanzarote, Canary Islands). Bulletin of Volcanology (2013), 75:740 DOI 10.1007/s00445-013-0740-3. GARCÍA, O., MARTÍ, J., AGUIRRE-DIAZ, G., GEYER, A. and IRIBARREN, I. Pyroclastic density currents from Teide (Tenerife, Canary Islands): implications on hazard assessment. TerraNova (2011) 23, 220–224. MARTI, J., SORIANO, C., GALINDO., I. and CAS, R.A.F. Resolving problems with the origin of the Las Cañadas caldera (Tenerife, Canary Islands): The Los Roques de García Formation – a major debris avalanche or an in situ stratified edifice building succession?. Geological Society of America Special Paper (2010) 464, p. 113-132, doi: 10.1130/2010.2464(06). Martí, J., and felpeto, A. Methodology for the computation of volcanic susceptibility: Application to Tenerife Island (Canary Islands), Journal of Volcanology and Geothermal Research (2010) 195, 69-77. SOBRADELO, R. and MARTI, J. Bayesian Event Tree for long term volcanic hazard assessment: Application to Teide-Pico Viejo stratovolcanoes (Tenerife, Canary Islands). Journal of Geophysical Research (2010), 115, B05206, doi:10.1029/2009JB006566. FERNÁNDEZ, J., TIZZANI, P., MANZO, M., BORGIA, A., GONZÁLEZ, P. J., MARTÍ, J., PEPE, A., CAMACHO, A.G., CASU, F., BERARDINO, P., PRIETO, J., LANARI, R. Subsidence induced by sinking of Tenerife intrusive complex measured by InSAR time series analysis. Geophysical Research Letters (2009), VOL. 36, L04306, doi:10.1029/2008GL036920. FOLCH, A. and MARTI, J. Time-dependent chamber and vent conditions during explosive caldera-forming eruptions. Earth and Planetary Science Letters (2009) 280, 248-253. GEYER, A. and MARTI, J. Stress fields controlling the formation of nested and overlapping calderas: implications for the understanding of caldera unrest. Journal of Volcanology and Geothermal Research, (2009) 181, 185-195. GOTTSMANN, J., LAVALLÉE, Y., ,MARTÍ, J., AGUIRRE-DÍAZ, G. Magma-tectonic interaction and the eruption of silicic batholiths. Earth Planetary Science Letters (2009) 284, 426-434. Martí, J., Geyer, A., And FOLCH, A. A genetic classification of collapse calderas based on field studies, analogue and theoretical modelling, From: THORDARSON, T., SELF, S., LARSEN, G., ROWLAND, S. K. & HOSKULDSSON, A. (eds) Studies in Volcanology: The Legacy of George Walker. Special Publications of IAVCEI, 2, 249–266. Geological Society, London. 1750-8207/09/$15.00 # IAVCEI 2009. Martí, J., Geyer, A., Folch, A. and Gottsmann, J. A review on collapse calderas modeling, in Gottsmann, J and Martí, J. “Caldera Volcanism: analysis, modelling and response”, Developments in Volcanology, Elsevier (2008): 233-283. PITTARI, A., CAS, R. A. F., WOLFF, J. A., NICHOLS, H. J., and MARTÍ, J. The use of lithic clast distributions in pyroclastic deposits to understand pre- and syn-caldera collapse processes; a case study of the Abrigo Ignimbrite, Tenerife, Canary Islands, in Gottsmann, J and Martí, J. “Caldera Volcanism: analysis, modelling and response”, Developments in Volcanology, Elsevier (2008): 97-142. Martí, J., Geyer, A., Andujar, J, TEIXIDO, F. and costa, f. Assessing the potential for future explosive activity from Teide-Pico Viejo stratovolcanoes (Tenerife, Canary Islands)., Journal of Volcanology and Geothermal Research, 178 (2008): 529–542. Marti, J., Spence, R., Calogero, E., Ordoñez, A., Felpeto, A. and Baxter, P , Estimating Building Exposure and Impact to Volcanic Hazards in Icod de los Vinos, Tenerife (Canary Islands), Journal of Volcanology and Geothermal Research, 178 (2008): 529–542. GEYER, A. and MARTI, J. The new worldwide collapse caldera database (CCDB): A tool for studying and understanding caldera processes. Journal of Volcanology and Geothermal Research (2008), 175: 334-354. ANDUJAR. J., COSTA, F., MARTI, J., WOLFF, J. A. and CARROLL, M. Experimental constraints on the pre-eruptive conditions of the climactic El Abrigo eruption, Tenerife (Canary Islands), Chemical Geology (2008), 257: 173-191 doi.org/10.1016/j.chemgeo.2008.08.012..
Costa, F., Dohmen, R., Chakraborty S. (2008) Time Scales of Magmatic Processes from Modeling the Zoning Patterns of Crystals. Reviews in Mineralogy and Geochemistry 69, 545-594. Costa, F., (2008) Residence times of silicic magmas associated with calderas. In: Caldera Volcanism: Analysis, Modelling and Response. Gottsmann, J., Martí, J., (eds) Developments in Volcanology 10: 1-55. Costa, F., Chakraborty, S. (2008). The effect of water on Si and O diffusion rates in mantle olivine and implications for transport properties and processes in the upper mantle. Physics of the Earth and Planetary Interiors 166, 11-29. Pittari, A., Cas, R. A. F, MONAGHAN, j.j. and Martí, J. Using instantaneous dynamic pressure to understand the behaviour of large lithic clasts at the base of a pyroclastic flow: examples from the Abrigo Ignimbrite, Tenerife, Canary Islands. Bulletin of Volcanology (2007), 69: 265-279. EDGAR, C.J. WOLFF, J.A. OLIN, P.H. NICHOLS, H.J. PITTARI, A. CAS, R.A.F. REINERS, P.W. SPELL, T.L. and MARTÍ, J. The late Quaternary Diego Hernandez Formation, Tenerife: a cycle of voluminous explosive phonolitic eruptions. Journal of Volcanology and Geothermal Research (2007), 160: 59-85. TOYOS, G. P., COLE, P. D., FELPETO, A. and MARTI, J. A GIS-based methodology for hazard mapping of small volume pyroclastic flows. Natural Hazards (2007), 41-1, 99-112. Michon, l., Staudacher, T., Ferrazzini, V., Bachèlery, P. Marti, J. The April 2007 collapse of Piton de la Fournaise: a new example of caldera formation. Geophysical Research Letters VOL. 34, (2007), L21301, doi:10.1029/2007GL031248. Felpeto, A., Martí, J. and Ortiz, R. A GIS-based automatic system for volcanic hazard assessment and risk management, Journal of Volcanology and Geothermal Research, (2007), 166: 106-116. Turner, S., Costa, F. (2007) Measuring time scales of magmatic evolution. Elements 3, 267-272. Pichavant, M., Costa, F., Burgisser, A., Scaillet, B., Martel, C., Poussineau, S. (2007). Equilibration scales in silicic to intermediate magmas – Implications for phase equilibrium studies. Journal of Petrology 48, 1955-1972.